74 out of the 81 initially selected candidates have participated in the competition week and 21 of them reached the Finals that took place on Saturday in front of a full house at the Beaulieu Theater. 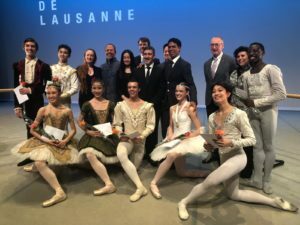 At the end of the Finals, the jury, presided this year by the ballet star and Gold Medal of the Prix de Lausanne 1990, Carlos Acosta, selected 8 Prize Winners. Thanks to their scholarships, these 8 talented dancers will have the opportunity to enter one of the prestigious partner schools and companies of the Prix de Lausanne.